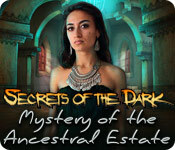 Secrets of the Dark: Mystery of the Ancestral Estate is rated 4.3 out of 5 by 69. Rated 5 out of 5 by Mrs_Kim from Save yourself from the evil creatures! The third game in the Secrets of the Dark series by Orneon ---------------------------------------------------------------------------------- Anyone who had ever played the games in the series will surely know that the trademark of this game is the switching rooms (not sure how to put it into words! >_<). I bought this game also because of this uniqueness. There are 3 levels of difficulties. I own the previous two games in the series and they are great fun. The scary creatures seem to follow us around, this time to Greece. And in terms of graphics, this one is definitely a big improvement. The hint and skip button recharges slowly although I played on the easiest level. Even so, the hint is pretty useful as it really shows clues! (literally!) so the hint is really helpful. The HOG is unique, combining objects and of different variety. For first time players of this kind of game may find it annoying of switching between light and dark, one chapter alone can mean a dozen or more switching just to use an inventory. Nevertheless this game is a nice break from the usual HOG game. I think the dev. is being very creative here with their game series. Hope they release a new one soon. Rated 5 out of 5 by grandmaloulu from A Must Have for your game library!! What a great game! The makers have put a new twist on old favorites. First, the graphics are really well done. The theme is spooky, without being over the top. (no disembowled bodies or killings) There is a wide variety of mini games, all with a different twist on the old favorites. A few classic HOG's, well lit and objects size appropriate, with several "put the object back where it goes" games. Each room has many things to do or accomplish, and even though there's no map for guidence, most tasks are within a few screens of where you picked up the item. There are several rooms that morph into another room, which is really neat. As the game progresses, the tasks get more difficult, which adds to the fun. Lots and lots of stuff to do. The help button is also a little different, because it shows you a picture of the room that the item is for, but then you have to figure out what you have in your inventory that goes there, or what you missed and need to revisit. This is just a really, really worthwhile game to have in your game catalog. EXCELLENT all the way around! Rated 5 out of 5 by rosekaufmann from STRONG & CHALLENGING - ESPECIALLY PUZZLES Took approximately 6 hours to complete this strong and challenging adventure game. 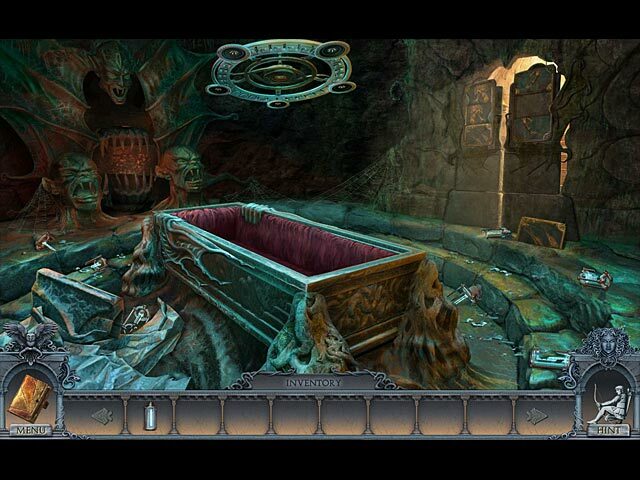 An evil brother is kept at bay by a light in the family crypt (who keeps a crypt in their mansion? ), until it breaks and the evilness escapes. Your job is to recapture him. GOOD: • Many puzzles of various complexities. But see my comment in “Not So Good.” Every minigame’s instructions are to solve the mini-game, period. Many of them are very, very challenging. Novices will likely skip them or look for a W/T with answers. All puzzles were directly tied into the story and gameplay. • Voice-overs are very, very good. • Many locations and lots to do. You can’t feel “cheated” with the location. Story keeps you interested throughout the game. Ending was great. • Every location has a bright, lovely and friendly modern scene, as well as an “identical or similar” dark and dreary evil scene. This multiplies the locations and you will have to travel between the two types of scenes to complete the locations. It’s a lot of fun, but you have to have a good memory or pen and paper. • HOS are either list-based or putting items into the scene where they belong. A lot of attention to detail and they are moderately but not overly crowded. Your prizes are directly related to the gameplay. There’s no disjointed HOS here. • Animation and graphics are great. NEITHER GOOD NOR NOT SO GOOD: • To further amuse yourself, click on the animals and watch vases. 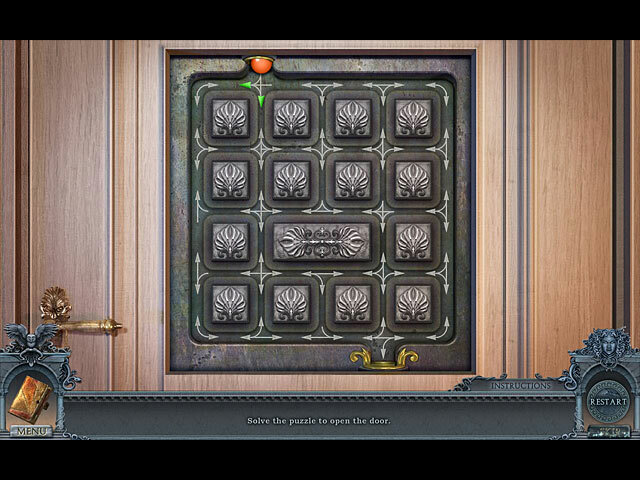 NOT SO GOOD: • Directions for puzzles are “solve the minigame to open” the door, exit, et al. That’s it! No additional information of what to do. The more experienced a gamer is, the more likely s/he can solve the puzzle. Unfortunately, newbies and most intermediates will have a great deal of difficulty figuring out what they are supposed to do and end up skipping them. Some of them make you feel smart when you complete them successfully. • Once you are able to escape the mansion into the outdoors, the more locations open up. There is no map, so you have to remember what objects you need to complete the scenes. This becomes quite a mental ordeal – pen and paper will greatly help those without the greatest memory once you have a large number of locations open. This becomes particularly frustrating, especially when you knew where you wanted to go but forgot how to get there. Rated 5 out of 5 by tobysue09 from worth every penny!! This game has it all! Great graphics, mini-games that are enjoyable, great storyline, very well-thought out game that keeps you on your toes!! One great SE!!! Rated 5 out of 5 by Plientje from very nice entertaining game! Just finished playing this game, and I had a wonderful entertaining time! It was terrific. Wonderful graphics and cutscenes. The "switching" between past and present is fantastic. how the same room can change! Loads to do in every scene The help button is very good,shows you exactly what to do and where. The HOS were pure fun, some higly interactive, most of them were visited twice, but changed in type, put things back, or sometimes lists. The puzzles were mostly known, but with new twists, some of them had me puzzled for quite a while! Music was ok, but became repetitive. The story has a really nice flow, it went on quite fast. The game ends conclusively. I really had a ball playing this game, and hope you will to! Enjoy this game! Rated 5 out of 5 by TinkNWendy from Amazing!!! I loved the hidden object scenes in this game. They were so fun and unusual. I also loved the switching a room from dark to light too! It made the game so much fun and so much more challenging in a way. It wasn't extremely hard but it wasn't boring either. It made me wish I had bought the CE. It truly was a lot of fun!! Rated 5 out of 5 by HunkaSister from Another Fine game from the Secrets of the Dark creators I have yet to be disappointed by this team who has created the "Secrets of the Dark" series. This game was excellent. I love the fact that there are multiple things that have to be accomplished. It really makes you think. Bravo to this team! Rated 5 out of 5 by ShaSha52 from Secrets of the Dark: Mystery of the Ancestral Estate I loved this game it had many twist and pulls within the game. Good mini games. Of the Secrets of the Dark series, I think this one is the best. Rated 5 out of 5 by stretchmymind from Another good one! I've really enjoyed the Secrets of the Dark games and this one was a great addition to the group. Changing the lighting of a room changes the scene and reveals a totally different room. Finally got rid of disaster prone friend but since you now have a reputation as a dispeller of evil, it finds you! You must put it back in the box - literally and save a young woman from her evil uncle who has already killed off the rest of the family. Backgrounds are good, animation is lacking, which is a shame, the puzzles range from easy to hard so there is something for everyone. The music is a small loop that is a bit irritating but can be turned down. This time I can't complain about inconsistencies in the background but the ancestral home that was supposedly set in Greece has some leanings to and English country home. Much more ignorable. The HO scenes are just enough and though the items are hidden well, you can find them all. There is a twist - you are supposed to put things into an HO scene. They then do something to reveal an item you'll need. There are lots of areas to explore and sometimes I'd forget where something was and have to wander around until I found it. All in all this game is worth hours of fun. Rated 5 out of 5 by Missiongirl from Excellent Challenge, hours of fun I love this series of games. The challenge is second to none as far as I am concerned. The fact that you seem to get 2 games for the price of one helps! 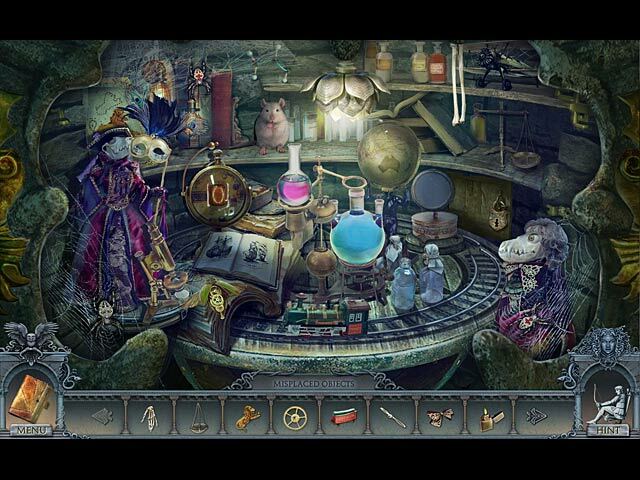 In most rooms you can change the light and this will change the room and require you to find different objects and complete different puzzles to complete that room. It does mean that you really have to have a good memory or write everything down!! The only thing this game lacks is an interactive map but possibly that would take away the level of challenge it does represent?? I thoroughly recommend these games but we warned, have a pen and paper to hand!